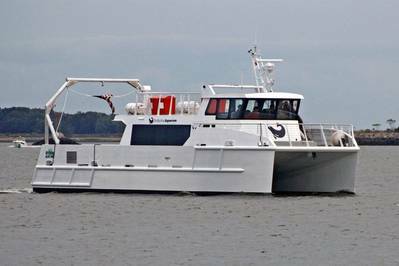 In 2015 two significant developments are going to make many operators, owners and builders of professional vessels consider hybrid marine power. Firstly the new emissions laws in ports, and secondly there is now an incentive for high technology manufacturers to invest in developing highly efficient batteries. Hybrid is ‘here and now’ technology that is being utilized by many industries around the world. The marine industry is now recognizing the potential of utilizing hybrid power and innovative propulsion systems for vessels in the sub IMO / sub 24 meter professional sector. This is not just green energy for the sake of it - ‘The Hour of Power’ focuses on hybrid solutions linked to viable business cases. For commercial and professional organizations the concept of running vessels with zero emissions at up to 10 knots for one hour will shape decisions that lead to improvements of in-service systems and procurement of next generation vessels. The overall objective is fuel saving and improved efficiency by all means. For the marine industry to move forward it needs to utilize expertise from aviation and other sectors to drive this innovation and support relevant safety standards. Automotive manufacturers in Europe, the Far East and the US have recognized that hybrid technologies such as PHEV (Plug-in Hybrid Electric Vehicle) utilizing lithium ion batteries will be dominant for the next decade. Reducing emissions from busses and trucks in the world’s major cities has been a major driver for lithium ion battery power storage. The need for self sufficient land based grid applications has further extended the capabilities of next generation battery and hybrid technology. Certain sectors are potentially well suited to hybrid diesel / electric systems. These include wind farm service vessels and pilot boats that have relatively consistent duty cycles. We are entering a period of rapid change and commercial opportunity in the hybrid marine market. End-user organizations, boat builders, engine manufacturers and naval architects are now investigating systems for survey vessels, superyacht tenders, patrol vessels and unmanned craft. The first international Hybrid Marine Power & Propulsion Conference will be held in October 2015, gathering an international group of experts to further identify the potential for utilizing hybrid power and innovative propulsion systems. John Haynes is an Associate Fellow of The Nautical Institute, Yachtmaster Ocean and Advanced Powerboat Instructor. Subject matter expertise includes high speed craft consultancy, product development and specialist training. He is managing director of Shock Mitigation.